As their graduation date approaches, many high school students are busy preparing for college. From visiting campuses to filling out applications, students are deciding what major to pursue and where to spend the next two-to-four years of their lives. There are tons of things to consider when looking at colleges: academics, campus life, financial aid, to name a few. In addition to those typical questions every student must ask, students who use power wheelchairs have their own criteria to consider. A high school senior, Quantum consumer advocate Bryson Foster hopes to pursue a college degree in communications and marketing, although he is still deciding which school he wants to attend. As a motorized wheelchair user, Bryson knows what his needs are and has developed a list of things to look for when choosing a college. 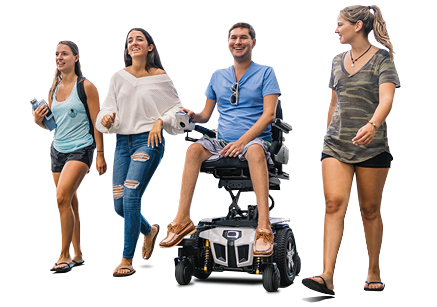 Check out his checklist for items to consider when choosing a college or university that meets the needs of electric wheelchair users. Bryson says: Not only do you need to make sure you can get into your dorm building easily, you also need to make sure the room is big enough for you to maneuver your power wheelchair. Bryson says: If you attend a school with a larger campus, you may not be able to travel from one side of campus to the other without help. Ask if there is accessible transportation available to students who use electric wheelchairs. Bryson says: While it’s important for you to be your own advocate, it’s good to have someone in your corner. Meet with the disability services team on campus and find out what they can do to provide support. Bryson says: Don’t let your disability limit you; Go after the degree you want! Yet, keep accessibility in mind so you can have the best college experience.